Airtel has launched a new Internet TV with DTH set-top box which is based on Android platform. This is India’s first Hyprid DTH set-top box that converts any standard TV into a Smart TV. The device is developed by LG electronics that offers 500 satelite TV Channels. It comes with popular online Video channels included NetFlix, Youtube, Google Play Music, Google Play Movies, Airtel Movies and more apps. The Set-top box runs on Android OS and it has 8 GB of internal storage. There are multiple ports supported including HDMI, USB, Ethernet, Wi-Fi and Bluetooth. Also it has Bluetooth-enabled remote control. It supports Dolby Surround sound so you can enjoy with great sound experience. Google voice search feature is included in this device, users can search for content by simply using the voice search. You can store videos or play videos from microSD card. The device is comes with Google Play app, so you can download and use apps or games on your TV. Airtel Internet TV requires an internet connection of broadband or 4G connection with recommended speed at least 4 Mbps. Also it supports 4K videos, pause/rewind and record the live shows. There is also screen casting feature that allows users to casting your videos from Android, iOS and Windows devices on the TV screen. 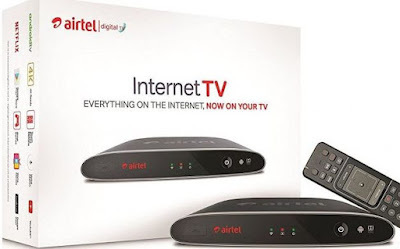 Airtel Internet TV is priced at Rs.4999 with 3 month TV subscription. Also It offers as an introductory offer, you can subscribe for Rs.7999 for a year with all HD and standard channels. Existing Airtel Digital TV users can get this device at Rs.3999 which provides 500 satellite channels. Existing Airtel broadband customers can get up to 25 GB additional data through MyAirtel app. Airtel Internet TV is available exclusively through Amazon.in site.